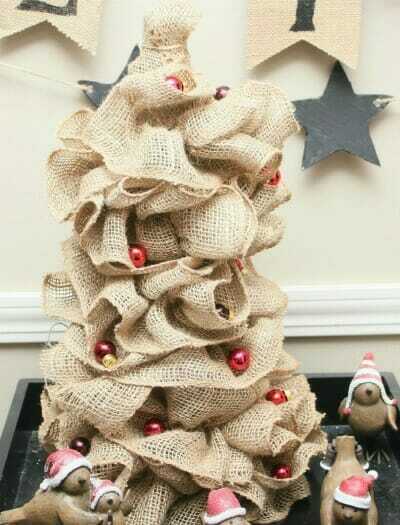 This burlap Christmas tree is easy to make. In fact, it will take you around 10 minutes from start to finish! It makes the perfect gift for someone — or to create and display yourself. Not only is is adorable, it is affordable to make! If you want to get creative, making an adorable, shabby chic burlap tree in just a few minutes. 10 to be exact. It not only looks amazing on your mantel, but it is an easy gift you can make and give to anyone you know. Start out by making a pull burlap garland (directions HERE). You will need to create two sets of garland (to ensure you have enough to cover your tree). Once the burlap has been pulled into the garland strands, with hot glue secure one end of the burlap to the bottom of the cone. *For extra security you can also use a tack or staple to attach the burlap to the cone. Wind the garland around the tree, starting from the bottom and working your way to the top. When you run out of one piece of garland, attach the next one where you left off (gluing it to the cone). In order to ensure your tree is full enough, make sure you use both pieces of garland. When you get to the top of the tree with the last piece of garland, wrap it over the top of the tree and use the little bit of leftover string (again, you’ll learn about this when you make your garland) and wrap it around the top of the tree. The last step is to glue your small ornaments to the tree (if desired). And then, your tree is done!! !